Princess Briana was killed by a drunk driver in 2004. Her nickname was "Breeze". 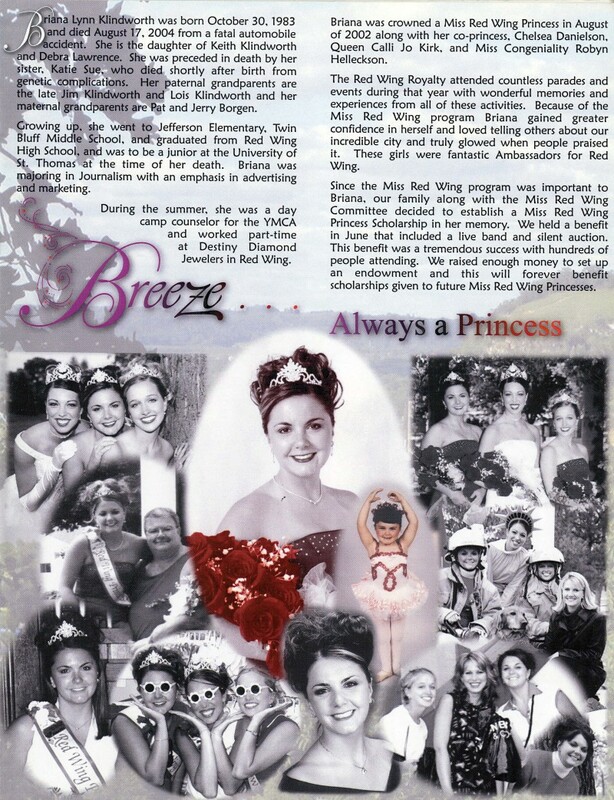 Because the Miss Red Wing Ambassador program was important to Briana, her family, along with the Miss Red Wing committee, decided to establish a Princess Scholarship in her memory. A benefit, which included a silent auction and live band from St. Thomas University, lead by Jimmy Eagle, was held at the local Elks Lodge to raise funds for the endowment. The family was hopeful to raise $10,000 but the event took in an amazing $20,000, which was invested with help from the St. Paul Foundation. The interest from the endowment has provided funds each year towards the two Miss Red Wing Princess scholarships. Our hope is that this scholarship fund will continue to grow and, along with our memory of Briana, will last forever. Since 2005, Red Wing Princesses each receive a scholarship from the Briana Klindworth Memorial Fund. To make donations to Briana's Memorial Scholarship Fund, please make contact us for more information.